Apple updated its Clips video creation app on Thursday, adding new assets to celebrate the Chinese New Year, as well as bug fixes and stability improvements. 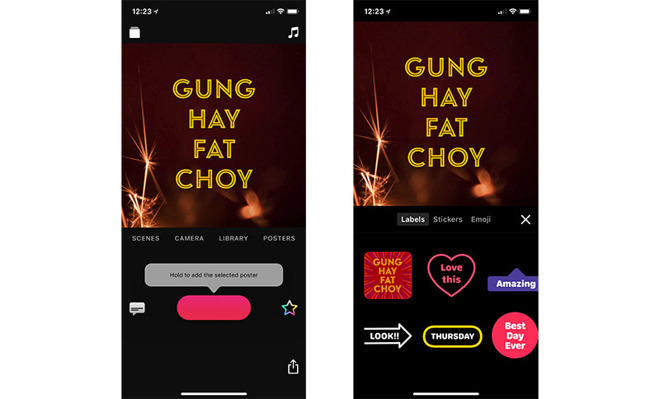 Clips version 2.0.2 is a minor update that introduces two new user features in an Apple-designed label and poster for Chinese New Year, which this year falls on Feb. 16. Seen above, both graphics feature the phrase "Gung hay fat choy," which is how Cantonese speakers wish someone "happy new year." In addition to the new poster and label, the latest version of Clips improves stability when browsing and recording Selfie Scenes on iPhone X. Introduced alongside iPhone X, Selfie Scenes integrate depth data from the phone's TrueDepth camera to overlay users into a variety of animated landscapes, movie sets and abstract art. A separate issue that caused the Top Secret poster to animate incorrectly during playback has also been fixed. Apple debuted last year as Apple's answer to standalone video creation apps designed to serve social media users. Like other first-party software, Clips features a streamlined interface and unique features like integrated dictation with Live Titles and the aforementioned Selfie Scenes. Clips is a free download from the iOS App Store.